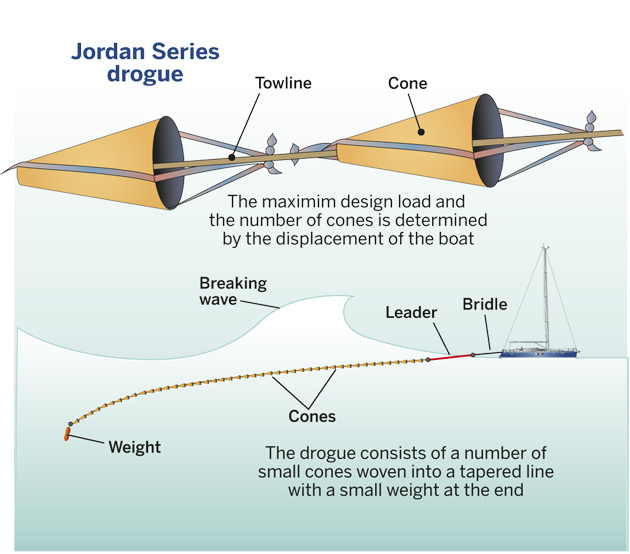 The Jordan Series Drogue (JSD) was the storm sailing apparatus that came out best in tests by the US Coast Guard, which would have pleased its inventor Don Jordan – he designed the drogue in order to save lives in storm conditions, especially breaking seas. It consists of small cloth cones spliced onto a tapered line with a small weight (often a length of anchor chain) at its end. The maximum design load of the drogue and the number of cones is determined by the displacement of the boat. Precise specifications are online here but, in general, 100-200 5in (13cm) diameter cones are attached to the line, and the line is attached to strong points on the stern quarters by a bridle. This is a better system than winches – on a winch the load is applied above the deck line and it tends to overturn a winch and pull it out. On my yacht, the Najad 380 Nereida, I attached the bridle to specially designed strong points on the quarters. Attachment points should, in general, be as far outboard and aft as possible and through-bolted, preferably using a strong steel backing plate if the deck is made of glassfibre. I have a dedicated bag strapped near the base of the stern arch/pushpit, close to the port quarter. 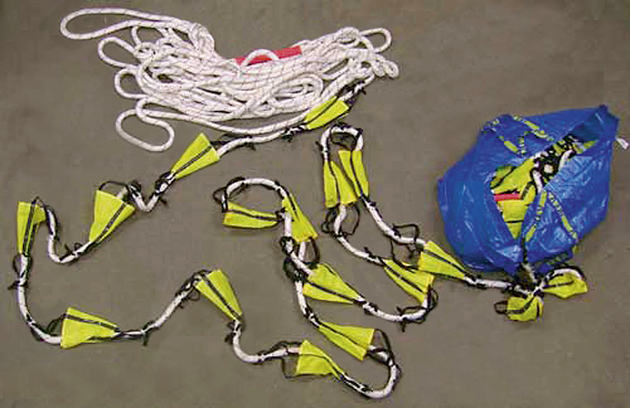 The line on my drogue – 207ft of 3/8in tapered Dyneema braid with a 75ft leader – has 124 cones and is flaked with the 10-15lb chain into the bag for immediate deployment. The bridle is attached with big shackles to the strong points at each quarter whenever bad weather is likely. I use cable ties to hold the bridle out of the water. I find a polypropylene retrieval line useful. It is a bit longer than to the end of the port bridle leg and cleated off before the drogue is deployed. I winch it in first to bring the leader line beyond the bridle to within reach. Some people prefer an arrangement with one leg of the bridle led to a winch from one of the strong points in order to keep the stern at a slight angle not full-on to the seas. Clearly, the companionway area must be tightly closed against any ingress of water. 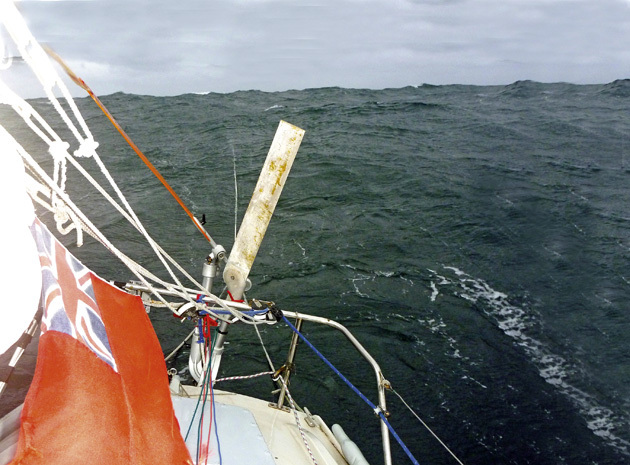 In April 2011, I lay safely for three and a half days off the Falklands in breaking seas when caught between two low-pressure systems – I actually had two sets come by close together, so waited for the second to finish – and eventually winched in the drogue after conditions eased. It took me a long time because I was solo, but it was not difficult. Now I have a cleat with horns pointing forward at the stern to act as a fairlead and allow the cones to come in easily without me needing to be there. They then pass around a winch with very little trouble. Writing this, I decided to seek the opinions of other sailors who had used a JSD successfully. 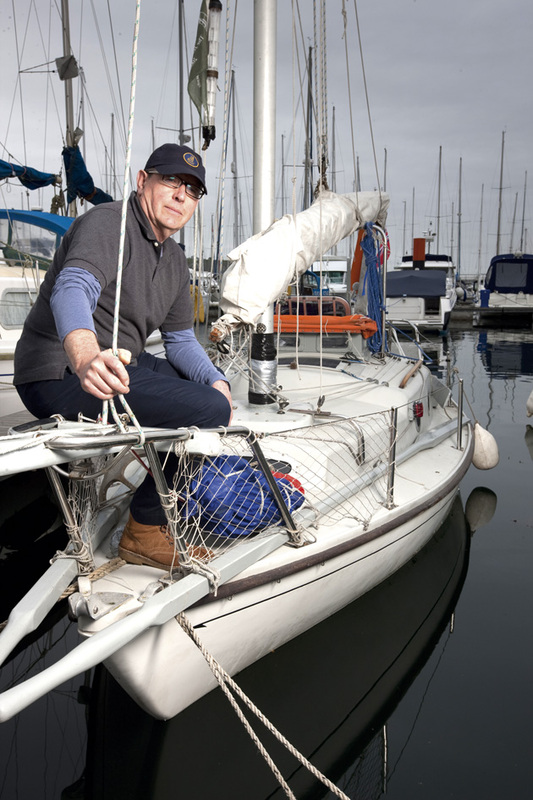 Steve sails Silas Crosby, a 36ft steel yacht with twin keels and 4ft draught, double-handed. Having made his JSD from a kit, he has used it three times, twice off Chile in galeforce winds. He says that seas were beginning to break, with the yacht running at five to six knots under bare poles, before he deployed the drogue for six hours and 12 hours respectively. “I used a retrieval line, making a rolling hitch to transfer it to the main line. The third deployment was in June 2013, 90 miles off Adak (Aleutians) in a far worse gale. We rode to the JSD for three days in winds up to 60 knots with lots of breaking seas. We had seas aboard, but down below was dry and there was little rolling. We never even came close to being knocked down or broaching. Single-hander Greg sails Alcidae III, a 40ft steel cutter. He used his drogue seven times in 49 days on passage from Kerguelen to Hobart in 2012, mostly in seas of 8-12m. But in one vicious gale lasting over five days he saw seas up to 14m. He finds it best to deploy the drogue while hove-to and flakes the JSD in the cockpit ready for deploying. Interestingly, he now dispenses with a bridle and uses a single line off the port quarter, saying the boat “seems to like” seas coming onto the quarter. On Taonui, a 42ft steel cutter, Tony sails double-handed. His JSD set-up uses 1in braid drogue line that’s 200ft long and has 120 cones, with 20ft of in chain attached via cleats to the quarters using a sturdy 1in braid bridle with a heavy duty swivel shackle. He has used this in anger eight times in the past 16 years, when it was no longer safe to lie hove to or ahull. His preference in storms is to run before the wind in winds up to 50 knots, but that is impossible for long when single-handing, if there is a lack of sea room or if he needs to make repairs, etc. All my ocean sailing is done single-handed in small yachts. This has two implications for heavy weather sailing. First, the boat cannot be helmed manually for long. Second, it will tend to lie beam-on to the seas – a very dangerous attitude. My Windpilot self-steering gear is fine for holding the boat to windward or running at an oblique angle. But very occasionally the sea states are simply too dangerous to sail in – the risk of capsize is too great. In my last yacht, Mingming, a 21ft junk-rigged Corribee, this happened twice during 20,000 miles of sailing in the high North Atlantic and Greenland and Norwegian seas. Both times I deployed my ultimate yachtsaver, my Jordan Series Drogue. The first time was during a severe gale off south-west Iceland. For some reason this storm generated some of the steepest waves I have seen. Occasional wave faces looked nearly vertical. Once the drogue had been deployed it seemed as if all the potential danger had been defused. As the drogue is set from the stern, the boat lay quietly in its natural attitude, absolutely stern on to the waves, with just a few degrees of yaw either way. We moved gently downwind at up to one and a half knots. As each crest passed under the yacht we accelerated gently forward until the drogue applied its force. Tailored to the displacement of my yacht, the drogue applied its force softly; not too much and not too little. It was an extraordinary sensation. As I lay on the cabin sole I felt the boat surge forward then, with a loud creaking as the braking started, gently slowing. There was a moment of near weightlessness as I was lifted off the sole then placed softly down again. It was like a kind of horizontal bungee jump. I rode to the drogue for 17 hours in total comfort without a hint of a broach or a capsize. Retrieval was not a problem as I lost the drogue through chafe (an error of seamanship on my part). Fortunately, the worst was nearly over by then and a homemade B&Q sandbag sea anchor saw us through the rest, although without the smoothness of the JSD. The second deployment of my replacement homemade drogue was south-east of Greenland’s southern tip, Cape Farvel. This short-lived storm had already built up a fine old sea and created the highest waves I had seen in the Northern Hemisphere. They were not especially steep, but they were truly monumental and were starting to break. The ride this time was not as comfortable since the wave trains were bisected by a residual swell. The drogue did its work of defusing the threat, but we rolled heavily as the swells passed under the beam. This was more of a discomfort than a danger. Manual retrieval of the drogue was hard because I had no winches on board. I have since added a floating line to the end to pull it in backwards. On Mingming II, a junk-rigged Achilles 24, cockpit space has already been allocated for stowage of the JSD. I would never go to sea without it. 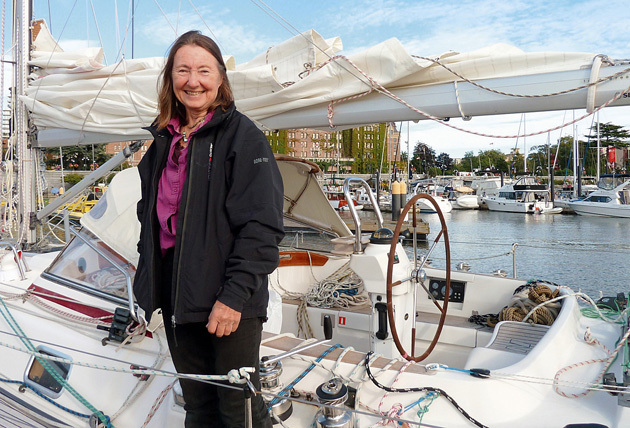 Single-handed sailor Jeanne Socrates has circumnavigated three times alone. After her last non-stop round the world voyage she was named runner-up in the Yachting Journalists’ Association Yachtsman of the Year Award and won the Cruising Club of America Blue Water Medal. She carries and has successfully used a Jordan Series Drogue on her Najad 380, Nereida.